Ginger is a root vegetable which is consumed in India and many other countries around the world. 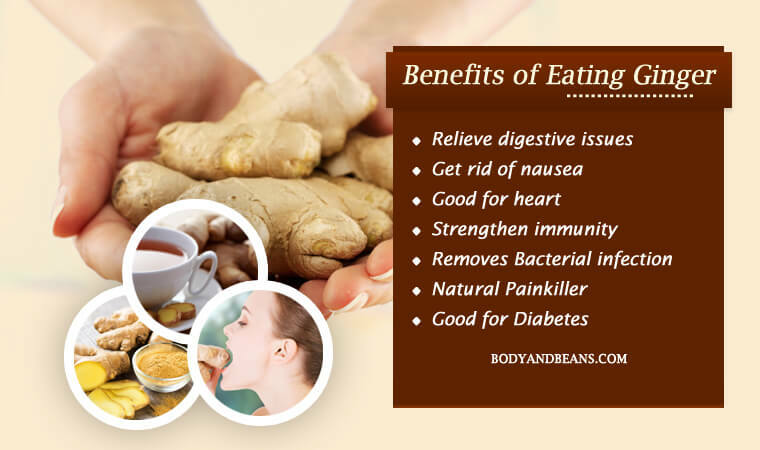 There are many benefits of eating ginger and probably that’s the reason why it’s used across the world, in various types of cooking and recipes. In Ayurveda, which is an ancient discipline of Indian medicine, ginger is used to cure various ailments, especially gastrointestinal issues. There are various clinical and non clinical trials suggest that eating ginger can help immensely in treating nausea and vomiting during pregnancy. Another benefit of eating ginger is that it improves the immunity of our body because of the nutrients bioactive compounds that it has. Today in this post, we are going to talk about various health benefits of eating ginger, and why this wonder ingredient should have a place in your kitchen. Ginger is produced in India, Jamaica, Indonesia, and across other countries in the world. Ginger belongs to the rhizome family, and is consumed as juice, extract, slices etc. Ginger can cure digestive issues, nausea, vomiting, minor infections, kidney problems, sinus and migraines etc. The list of benefits does not end here. I was suffering from excessive cough and cold, and also severe migraine headache. The pain was unbearable; I could not sleep or eat properly during those days. My grandma suggested me to take ginger juice. I boiled few slices of ginger in water, and then drank that warm water multiple times in a day. I got immense relief after taking the ginger juice. When I started researching and reading about this wonder ingredient, I came to know that there are many benefits of eating ginger. Ginger is filled with phenolic compounds, which can help in relieving the digestive issues. Ginger increases the bile production in the liver and the food is easily digested. Ginger also helps in smoothening of the gastrointestinal tract. It also helps in suppressing gastric contractions. If you are having acid reflux or heartburn, then ginger juice or ginger extract can cure the problem within minutes. During cancer treatment, nausea is a common symptom and ginger tea can cure the nausea. Sometimes, when you take antibiotics, nausea is often the side effect. During pregnancy, nausea is often the side effect. You can drop few slices of ginger in water and bring it to boil, and then make tea as usual. The ginger extract will get mixed with the tea. Ginger tea or ginger juice is beneficial for your health in curing the bouts of nausea. Ginger has anti-clotting properties which can help in preventing diseases like stroke and heart attack. The blood circulation is regularized and the heart blockage can be prevented. If you are taking ginger then the blood pressure is normal, and the heart will not have to take much pressure to pump the blood through the blood vessels and the veins. Ginger helps in boosting the immunity so that you can avoid the flu, infections, fever etc. Ginger helps in detoxification, it gets rid of toxins out of the body and the immunity is strengthened. If you want to get rid of diseases like cough and cold, and infections in respiratory system then you can include ginger in daily diet. In 2011, a study was published in The Journal of Microbiology and Antimicrobials which tested that ginger can kill the bacteria and pathogens. Bacterial infections in your body can cause severe illness like diarrhea, irritable bowel syndrome, skin rashes, infections in tongue and throat, etc. Ginger tea or ginger extract can be stored in bottle and drink it daily. Scientists in University of Minnesota discovered that daily intake of ginger can slow down the growth of cancer cells. University of Michigan found out that the above statement is true especially in the case ovarian cancer. They found out that, “Ginger treatment of cultured ovarian cancer cells induced profound growth inhibition in all cell lines tested”. Basil Roufogalis, executive director of Herbal Medicine Research and Education Center said that “the most likely way to administer ginger as a painkiller would be in the form of a tea taken several times a day, but more work needs to be done on the amount of ginger powder needed per dose to take effect, and the time required between doses”. In 20016, a study was published in The Journal of Agricultural and Food Chemistry that ginger intake can prevent the sorbitol accumulation in human blood cells. Ginger intake can give a boost to the insulin production of your body and thus improve or reverse diabetes. 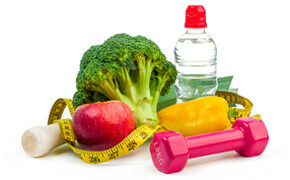 It can also help in curing diabetes related complications like diabetic retinopathy. Ginger is loaded with nutrients and minerals and here are some of the essential nutrients it has. After seeing the nutritional value of the root vegetable, you can already guess the health benefits of ginger. Ginger is actually the best ingredient ne can have in the kitchen. You can eat raw ginger or dried ginger in many ways. You can add sliced or crushed ginger to the boiling water to make ginger tea. Ginger water can be made by adding raw ginger in lukewarm water. It’s very good for your health. Ginger is normally considered as safe. But excess of anything may be bad and hence, depending on your experiences and how your body responds to eating ginger, you should adjust the quantity and frequency of eating ginger. The smell of ginger can add to the taste to your food and also make you healthy. Ginger can be used as a garnish or key ingredient for cooking. If you are not eating ginger, then maybe you should start having some.